MANILA, Philippines - (Updated January 12) CLE RESULTS OUT. The December 2017 Criminologist board exam results or Criminology Licensure Exam (CLE), which include the official list of passers, top 10 (topnotchers), top performing school and performance of schools are released online on Friday, January 12, 2018 or in twenty-one (21) working days after the exams. UPDATE: 13,025 out of 36,516 passed the exams. The Professional Regulation Commission (PRC) and the Board of Criminology administered the CLE on December 8, 9 and 10 (Friday to Sunday) in Manila, All Regional Offices; Zamboanga, General Santos and Rosales, Pangasinan. From January 23 to February 9, 2018, registration for the issuance of Professional Identification Card (ID) and Certificate of Registration will be done on-line. Visit the official website of PRC (www.prc.gov.ph) and follow instructions for initial registration. 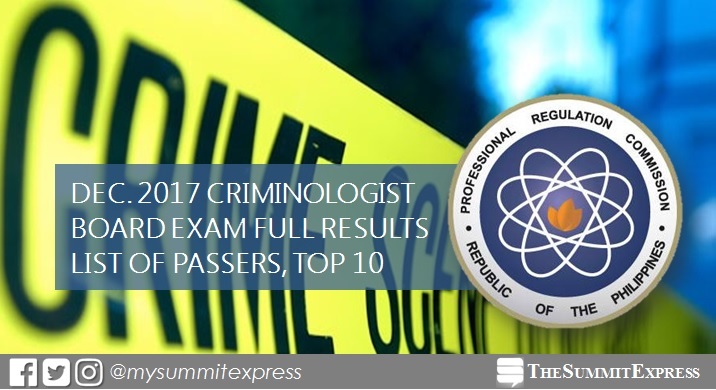 The December 2017 Criminologist board exam covered the following subjects: criminal jurisprudence, procedure and evidence and law enfocement administration (Day 1), criminalistics, crime detection and investigation (Day 2); and sociology of crimes and ethics and correctional administration (Day 3). According to PRC Resolution No. 2016-1019 which deals with the 'Schedule of Licensure Examination for Year 2017', the target release of Criminologist board exam results is on Tuesday, January 16 or in 23 working days after the exam. However, results may be released ahead of the target or on later date without prior notice. In the October 2016 Crim board exam, results were out in 25 working days after the exams. 10,901 out of 34,768 (31.35%) passed the tests. Christine Joy Almano Capalar from Sultan Kudarat State University - Tacurong topped the board with 91.55%. In the October 2015 exams, results were officially released in 24 working days. PRC named 9,671 out of 29,591 (32.68%) who hurdled the series of tests. Chervin Loewe Bihag Navilla from the Philippine College of Criminology aced the board with 92.80%. We advise examinees to monitor release of results starting the second week of January 2018. University of the Cordilleras (UC) is consistently topping the Criminologist licensure exam in the past years. In the October 2015 and 2016 exams, UC dominated the schools with 94.20% and 95.16%, respectively. From time-to-time, monitor updates on release of results and other announcements on The Summit Express. Our partner exam results portal PRC Board News will also have a dedicated page for the recent Crim board exam. Good luck to all takers!